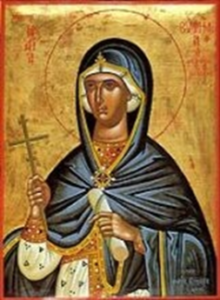 Saint Euphemia, “well-spoken [of]”, known as the All-praised, was martyred for her faith in 303 AD. According to Christian tradition, this occurred at Chalcedon where she was arrested for refusing to offer sacrifices to Ares. Her sacred relics are preserved in the Patriarchate in Constantinople. Thou didst abolish death by Thy Cross; Thou didst open Paradise to the thief; Thou didst transform the myrrh-bearers’ lamentation, and didst bid Thine Apostles to preach that Thou art risen, O Christ God, granting great mercy to the world. Save, O Lord, Thy people and bless Thine inheritance; grant Thou unto the faithful victory over adversaries. And by the power of Thy Cross do Thou preserve Thy commonwealth. O Euphemia, Christ’s comely virgin, thou didst fill the Orthodox with gladness and didst cover with shame all the heretics; for at the holy Fourth Council in Chalcedon, thou didst confirm what the Fathers decreed aright. O all-glorious Great Martyr, do thou entreat Christ God that His great mercy may be granted unto us. St. Paul’s Letter to the Galatians 2:16-20. Brethren, knowing that a man is not justified by works of the law but through faith in Jesus Christ, even we have believed in Christ Jesus, in order to be justified by faith in Christ, and not by works of the law, because by works of the law shall no one be justified. But if, in our endeavor to be justified in Christ, we ourselves were found to be sinners, is Christ then an agent of sin? Certainly not! But if I build up again those things which I tore down, then I prove myself a transgressor. For I through the law died to the law, that I might live to God. I have been crucified with Christ; it is no longer I who live, but Christ who lives in me; and the life I now live in the flesh I live by faith in the Son of God, who loved me and gave himself for me. Dr. John G. Ziegler (12 yrs) survived by his loving wife Katherine, 4 children, 5 grandchildren, 1 sister and 1 brother. Zaharenia Dikegoros Kutsukos (4 yrs) survived by her husband Harry, son John (Lori) & grandchildren John, Kristina, Peter and Jack. Panny Baluris (12 yrs) survived by her daughter Nina McGuirk (Tom) & granddaughter Erin Ryan (Kevin). Georgia Michel (20 yrs) survived by her daughter Kalliope Xenakis, her sons James & Peter, grandsons Demetrios Xenakis & Anthony Michel & 2 great grandchildren. Program Registration Registration forms are available on the table in the south narthex and at the pangari. Junior Choir Do you know what Katy Perry, John Legend, Kevin Costner, Carrie Underwood and Justin Timberlake have in common? They all started in the church choir! We are calling all future stars, young and old, to join the new Junior Choir. If you are interested, call Mona at (954) 240-3271. Greek School The Greek School at St. Demetrios will offer six classes during the academic year 2018-19. Classes A’, B’, Γ’, Δ´ and Adult Beginner are scheduled to meet on Mondays from 4:15 to 6:00 PM. The Advanced Modern Greek class will meet from 6:00 to 8:00 PM. Registration details will be announced as soon as the website is updated. 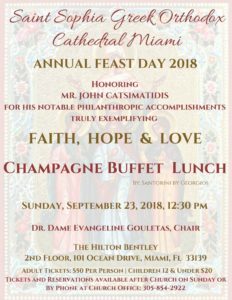 For more information, please call the St. Demetrios office at 954-467-1515 Monday through Thursday. Welcome to all who wish to explore the Modern Greek language and its 3,000+ year history. 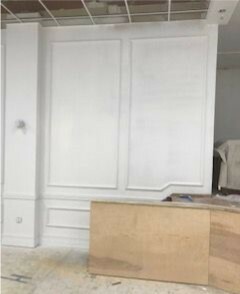 Σας προσκαλούμε στη μελέτη της ωραίας ελληνικής γλώσσας που έχει βαθειές ρίζες στην αρχαιότητα. Youth Programs Volunteers Our community is blessed with a holistic youth program that includes Sunday School, Greek School, Dance, GOYA, HOPE/JOY and a Youth Library. All these programs need volunteers to share in the fulfilling work of educating our youngsters. All volunteers must fill out an application each year. 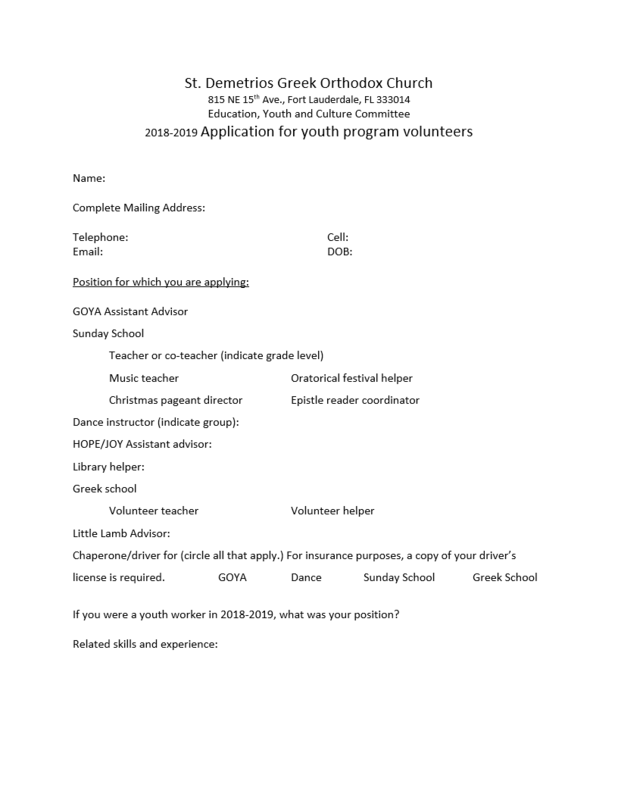 Please pick up an application from the table in the south narthex and turn it in to the office or to the appropriate youth adviser. Fellowship Hour In loving memory of her husband Dr. John G. Ziegler, Katherine Ziegler is sponsoring today’s coffee hour. Service Project Please join us for our SOUP KITCHEN SERVICE PROJECT! When: Saturday, September 22 Time: 7:45am-11:00am. We will set up, serve food, distribute clothing, make bagged lunches and clean up. 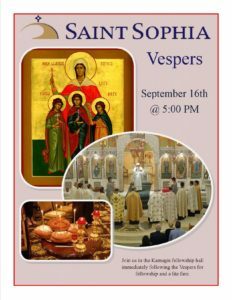 We welcome and look forward to having parishioners of all ages join us! 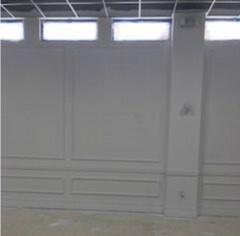 Large Hall Renovation Renovation The walls have been primed and ready for paint! 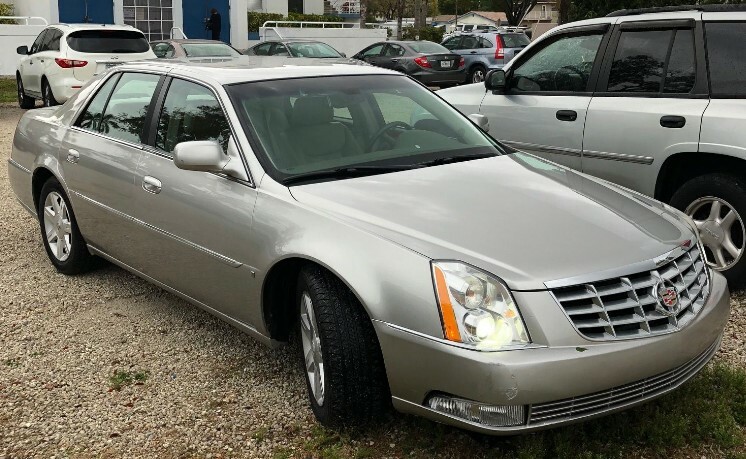 Car Donation Dr. Hionis has generously agreed to donate all proceeds from the sale of his 2006 Cadillac DTS with 66,000 miles to St. Demetrios. It has new tires and is in excellent condition. The asking price is $4,000. Please contact the church office or one of the Parish Council members if you are interested in purchasing this car while simultaneously helping St. Demetrios.